Quantitative measures – readability and other scores of text complexity often best measured by computer software. Qualitative measures – levels of meaning, structure, language conventionality and clarity, and knowledge demands often best measured by an attentive human reader. complexity generated by tasks assigned often best made by educators employing their professional judgment. Determine the quantitative measures of the text. Analyze the qualitative measures of the text. Reflect upon the reader and task considerations. Recommend placement in the appropriate text complexity band. Step 1 — Determine the quantitative measures of the text. We can use the Lexile level of a text from the Scholastic Achievement Manager (SAM) or the Lexile Analyzer to place the text within a text complexity band. Step 2 — Analyze the qualitative measures of the text. We can use the Qualitative Rubric for Literary Text (available from the Kansas Department of Education on EngageNY) to analyze the important elements of literary texts that are missed by readability software programs, such as levels of meaning, levels of purpose, structure, organization, language clarity and conventionality, and prior knowledge demands. For drama and poetry, quantitative measures are less valid, so we must rely on qualitative measures to help us place texts. We can use the Qualitative Rubric for Informational Text (available on EngageNY from the Kansas Department of Education) to evaluate similar elements of informational texts, such as levels of purpose, structure, language clarity and conventionality, and prior knowledge demands. Step 3 — Reflect upon the reader and task considerations. When we reflect on our students as prospective readers of texts, we should take into account the motivation of these readers, their knowledge and experiences, and the purposes for reading the texts we set for/with them. Additionally, it is important for us to consider how complex the tasks are that we will be assigning in conjunction with the texts and how complex the questions we will pose will be. The Suggested Considerations for Reader and Task document provides a set of questions to guide our reflections (available from the Louisiana Department of Education on EngageNY). Step 4 — Recommend placement in the appropriate text complexity band. The webinar and PowerPoint presentation (Text Complexity Tools) demonstrate the process for placing To Kill a Mockingbird in the grade 9-10 text complexity band. Appendix A illustrates the process for placing Narrative of the Life of Frederick Douglass at the high end of the grade 6-8 text complexity band (pp. 11-12), The Grapes of Wrath in the grade 9-10 text complexity band (pp. 13-14), and The Longitude Prize in the grade 9-10 text complexity band (pp. 15-16). The goal of this process is to help us become more purposeful in our selection of texts so that we can help our students climb the staircase of complexity leading to college- and career-readiness. By selecting texts that increase progressively in complexity through the grade levels for our instructional focus, we will improve the likelihood that students will be able to successfully meet the text demands of college or their chosen careers by the time they graduate. So now that we have information about how to go about placing texts, how do we go about implementing this shift and Standard 10? The Kansas State Department of Education is calling for the development of “complex text playlists” that would reflect the placement of texts using the three-part model of text complexity. Participants in the NCTE Connected Community have also been discussing the development of a database of quality classic and contemporary texts by grade level and text complexity band to expand the limited list provided in Appendix B. Both this “playlist” and this database have yet to be fully developed and published, but if and when they are, they will be invaluable resources to teachers striving to provide students with this staircase of complexity. In the meantime, the Cooperative Children’s Book Center at the University of Wisconsin-Madison has compiled a list of contemporary titles that address the text complexity expectations of the Common Core Standards for grades 6-8, 9-10, and 11-CCR with age range recommendations. This list includes works of fiction and nonfiction, poetry, and short stories, most of which have been published in the last six years. 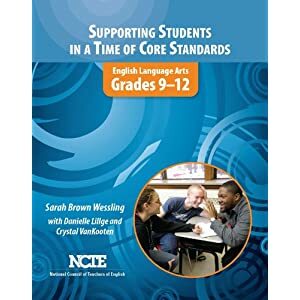 For more insights on working with complex texts, you may find this chapter authored by 2010 National Teacher of the Year Sarah Brown Wessling helpful in the NCTE publication Supporting Students in a Time of Core Standards: English Language Arts, Grades 9-12. Additionally, the April 2012 issue of Adolescent Literacy in Perspective, published by the Ohio Resource Center, is dedicated to the topic of text complexity and offers more perspectives on selecting texts, scaffolding instruction for students reading below grade level, and working across content areas to provide students with access to complex texts. This issue also contains links to additional resources–including the Greece Central School District ELA webpage. The Common Core Standards for Reading for Literature at grades 9-10 and grades 11-CCR specifically call for students to read and analyze Shakespearean dramas. Many of you are about to begin a study or are currently studying a Shakespearean work, such as Romeo and Juliet, Macbeth, or The Taming of the Shrew, with your students. In partnership with the Royal Shakespeare Company and the British Museum, the BBC has developed a season of programming to explore “how one man captured so much about what it means to be human” as their contribution to the London 2012 Festival. This site includes podcasts, videos, and teacher resources. How Should Shakespeare Really Sound? This blog post from The Telegraph contains audio recordings from the British Library’s CD based on current scholars’ beliefs about how Elizabethan English would have sounded. Recordings include passages from Romeo and Juliet and Macbeth and Sonnet 116. Available on this site are primary source materials, lesson plans, study guides, videos, and an online discussion forum for teachers. The March 6 virtual field trip has been archived and is available for viewing through May 31, 2012. With links to videos from past productions, essays from playbills, ideas for teaching activities, and information about the plays, the contexts of the plays, and Shakespeare’s language, this site will help you bring the study of the Shakespeare’s plays to life. Through blog posts about performing the plays at the Globe Theatre, mock social networking sites for the plays’ characters, interviews with actors, and access to directors’ edits of the plays, this site helps students gain a greater understanding of the plays and how they’re brought to performance. The British Shakespeare Association is offering free access to the inaugural issue of its new publication Shakespeare in Education. This issue presents articles with a multitude of ideas for teaching the plays. While perhaps somewhat dated, Stephen Colbert discusses 2008 presidential candidates Barack Obama and John McCain with Harvard Shakespeare professor Stephen Greenblatt, making comparisons between the candidates and characters in Shakespeare’s plays. You may want to consider updating this activity by having students compare the 2012 candidates with Shakespearean figures. On Saturday, May 19, 2012, Nazareth College will again be hosting this annual celebration to promote reading and to connect teens with authors. The festival runs from 9 a.m. to 5 p.m. and is free. The schedule provides participants with the opportunity to attend three author presentation sessions over the course of the day. Festival-goers will also be able to purchase books throughout the day from one of the sponsors, Barnes and Noble, and to have their newly purchased or previously purchased books signed by the authors at the end of the festival. Thirty authors plan to participate. More information is available on the Teen Book Festival website and on the official festival brochure. The festival organizers have also assembled a TBF Frequently Asked Questions document. Please encourage your students to attend, and please consider attending yourself. The festival is open to everyone, especially teachers and librarians, but seating preference will be given to teens at all sessions. And the Greece Marching Band will be leading the parade of authors down North Campus Drive at 8:45 a.m.!